Jan. 18, 2019, 4:32 p.m.
Do we need to do hashtag ten years challenge to post in this thread? 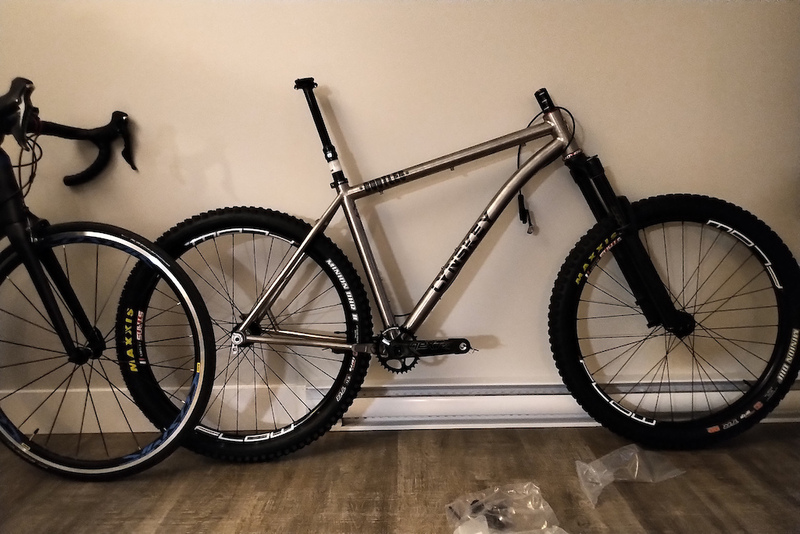 Jan. 18, 2019, 8:26 p.m.
Jan. 19, 2019, 10:45 p.m.
Here’s my Pässilä Bicycles Rämäkkä titanium hardtail. I use it for everything from long rides to enduro racing. 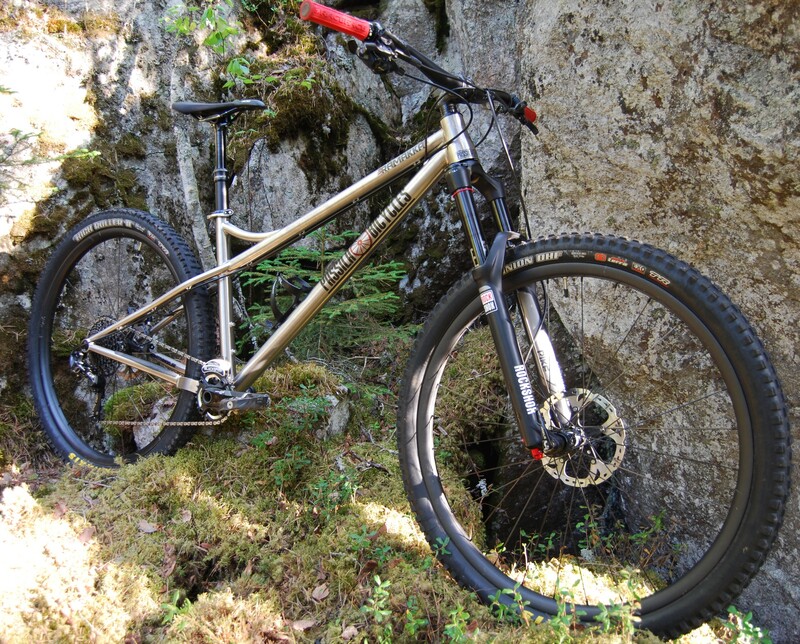 Proper modern geometry and titanium frame: match made in hardtail heaven! Last edited by: Häivä on Jan. 20, 2019, 7:51 a.m., edited 6 times in total. Jan. 21, 2019, 8:13 a.m.
Jan. 21, 2019, 11:08 a.m.
Just get green grips, saddle and pedals to match. Jan. 22, 2019, 3:36 a.m.
Chromag Stylus Single Speed (and occasional Box 7 speed). Yea, I know that the chain tensioner is upside down (and the chain a bit loose) but it seems to be the only way to make it work with the oval ring. Options are: A round ring, a rear derailer style tensioner, or just to keep pedaling..... even if it makes your eyes bleed! So the story behind her is that a mate was trying to sell a Stylus frame and fork combo. I took it for a test ride and promptly laid it down in a rock garden, putting a series of toonie sized dents in the top tube! Before he knew what had happened my money was in his bank account and the frame was at a panel beater. This guy normally does custom cars and Harleys so he did an awesome job with the dents. He then laid a fine coat of pearlescent, metallic rootbeer over the evidence. The logos are painted on in pearl white too. I’ve swapped out the orange fork decals for black since the photo too. About 7 years ago I got to spend 12 months in BC and 6 on the shore. I was always blown away by the locals laying waste to the scariest trails that I’ve ever seen on these crazy hardtails. So I was always going to have a Chromag of my own. It didn’t happen quite the way I planned, but it did finally happen! Jan. 22, 2019, 7:50 a.m.
some incredible bikes. that repaired Chromag is a stunner, what a crazy story. 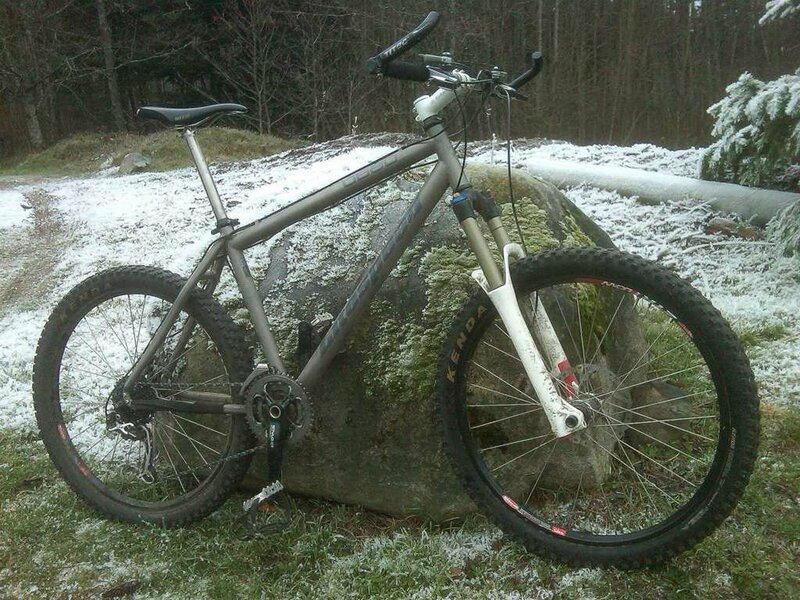 super high marks for the bizarre Finnish ti hardtail and extra points for the sheer number of dots in the name. Jan. 22, 2019, 12:44 p.m.
Jan. 22, 2019, 4:15 p.m. Some really nice Chromags. I agree, the rootbeer one is spectacular despite a rocky start to its life. Mine is slowly coming together. Some Ti King Cages will complete things. Should be finished in a week or two. Last edited by: RAHrider on Jan. 22, 2019, 5:33 p.m., edited 1 time in total. Owning a Chromag Surface Ti myself I can see the same factory made the Ti as the Finnish bike. The head tube is identical, and considering how expensive Ti is I can see why. I have had my Chromag for 8 months now and could not be happier with the purchase. 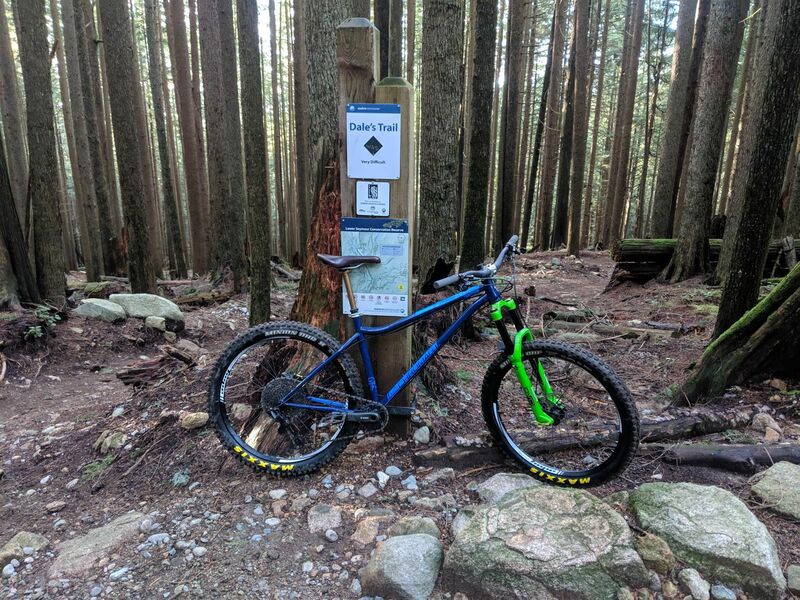 No, I cannot go down the gnarliest trails I can do, but the ride quality and satisfaction are second to none. Worth it all for sure. Jan. 23, 2019, 4:23 a.m.
That Chromag Rootdown and Stylus are two beauties. Oh my god. Jan. 23, 2019, 10:13 a.m. Which Lynskey frame is that? Thanks! Jan. 23, 2019, 5:19 p.m.
Yup. The rear (2.8 DHR on a hope 35w) is 69mm lug to lug, center of rear axle to tallest point around 365mm. Lug to lug is with calipers so that is pretty accurate. The 365mm could be plus or minus a few mm as it's a little tough to measure. Tire is at 18psi. Jan. 23, 2019, 10:21 p.m.
Should have the rest of the build ready to go by next week.